John Deere is introducing the new five-walker W330 and six-walker W440 entry level combine harvesters for the 2015 season in the UK and Ireland. Offering reliability and simplicity at a low operating cost, these John Deere branded combines are the result of a marketing agreement with Finnish manufacturer Sampo Rosenlew, and feature 210 and 238hp Sisu engines with maximum power ratings of 216 and 253hp. The W440 is available in two versions, either with or without a pre-threshing cylinder (PTC); this is standard on the W330 model, which has a grain tank capacity of 5200 litres. The base W440 model has a 6500-litre grain tank, while the W440 PTC combine holds 7600 litres and can be emptied at up to 100 litres/sec. Header sizes from 3.9 to 6.9m are available, depending on the model. In addition to these new W-Series combines, a new high-performance package is now available for the T-Series, designed to increase separation performance in high-yielding crops and green straw conditions. Further up the range, the S670 combine will have a new Stage IV compliant engine for 2015, featuring a 19hp increase in rated hp (ECE R120) to 392hp with maximum power boosted to 449hp. The new John Deere engine’s integrated emissions control system utilises a combination of proven components, including cooled exhaust gas recirculation (EGR) and smart exhaust filters, together with selective catalytic reduction (SCR) technology. The entire system is optimised to meet emissions regulations while delivering maximum performance, reliability and durability. A new four-strand feederhouse is available on level-land S-Series combines, while Active Concave Isolation (ACI) and heavy-duty separator grates are standard on all 2015 S680, S685 and S690 combines, which continue to be powered by John Deere’s existing Stage IIIb engines. These new features are designed to provide higher feeding capacity and smoother crop flow at higher throughputs, resulting in better reliability, threshing & separation, particularly in tougher crop conditions; up to five per cent more capacity has been measured at the same loss level in straw moistures above 25 per cent. The S-Series range can be equipped with all-new 8.7m (28½ft) rigid and 7.9m (26ft) folding unloading augers, to match wider 12.2m (40ft) headers and controlled traffic farming systems. Noise levels in the redesigned cab have also been reduced by 5dB(A). With its latest ‘ConnectedCombine’ package, John Deere now offers a number of intelligent solutions to optimise machine performance in the field, including John Deere FarmSight Services dealer support. Key elements of this concept include AutoTrac guidance, Interactive Combine Adjustment (ICA) and Remote Display Access (RDA). 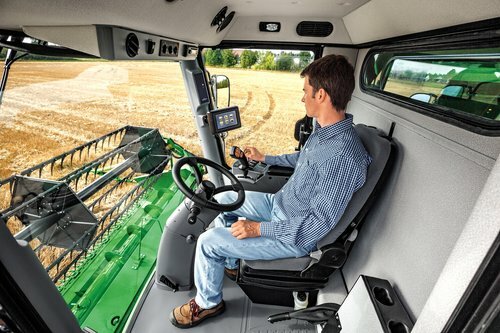 The ICA system is available on all W, T and S-Series combines, and is integrated into the cab’s armrest display, while the ICA’s own display is available with an optional touch screen. Designed to minimise losses and optimise both grain and straw quality, ICA offers the operator a selection of several harvesting strategies and a choice between single or multiple optimisation targets. No matter what the operator values most – whether it’s grain quality, throughput, a cleaner sample or straw quality – direct feedback on changes in performance is provided; there is no need to rely on an optimisation strategy preset by built-in software. As a result, the ICA system can provide significant savings and quality assurance throughout the harvesting season, regardless of crop type. John Deere’s GoHarvest mobile phone app is also available as a free download for smartphones and tablets. This latest application allows operators in the field to optimise their combine easily and always have the recommended John Deere settings to hand. Alternatively, RDA enables the dealer or farm manager to remotely view the GreenStar 3 2630 and the Generation 4 CommandCentre displays in the cab and, if necessary, advise the operator on how to optimise the combine settings for maximum efficiency. RDA can also be used to carry out operator training, for example. To further enhance machine and fleet performance, John Deere S-Series combines can be fitted with JDLink telematics and Machine Sync harvesting logistics systems, both additional elements of the John Deere FarmSight strategy.